Today, I get a patio. Can I tell you how wonderful those words are? It has taken me three months of trying to find someone (anyone!!) who was willing to build me a patio for less than the cost of the national debt, and who, after realizing it was a small 150 sq. ft. job--it's a zero-lot line house, people!! I have no more room to add more patio!--would actually take on the project...BUT, I did it. I found what appears to be an extremely professional and very competent company to build the patio in pavestones for the same cost as aggregate concrete (concrete with pebbles in it...). I am thrilled with the service so far. We will know for sure how they do when I get home from work today, as they should currently be at my home laying pavestones! The company that is doing the work is Precision Pavers (the link is to some pictures of their work), and the customer service I have thus far received is definitely worth shouting about. My design consultant, Tim, spent an hour with me Saturday giving me a quote for my teeny wheeny job. He even drew the patio design we decided on onto a quote sheet with graph paper, so that I could see the exact scematic! And today, when the bricks came in a slightly different shade than the samples he had shown me, he called to have me approve them. The new colors were actually even better than the original samples, and I was thrilled. When he discoved today that my yard had a slight slope that he hadn't noticed Saturday (because it was raining, and we were both trying to avoid getting soaked) he told me he would raise the low side for free. 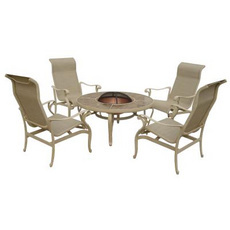 Oh, I also bought a patio set yesterday. I think the firepit will be a lot of fun. I see a S'mores party in my future!